The penile skin flap can provide single-stage reconstruction of strictures from the bulbar urethra to the meatus. An understanding of the patient comorbid disease status, penile tissue quality, and stricture length and location are critical for preoperative planning. The ideal flap will be hairless, accustomed to the aqueous environment, adaptable, and cosmetic. 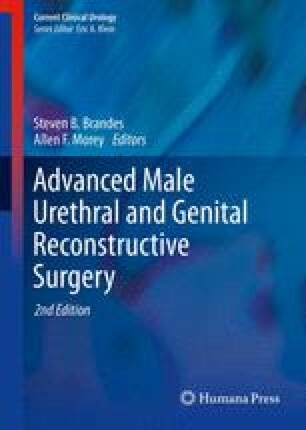 This versatile and technically challenging technique calls for a thorough understanding of penile vascular anatomy and the fascial layers. All penile flaps share a common blood supply from the external pudendal artery, and all involve the isolation of an island of skin. Penile flaps are best described by their anatomic characteristics such as the orientation and location of the harvested skin island, the origin of the pedicle, and how the penile flap is utilized to treat the stricture. Details regarding our operative approach to performing penile skin flaps are provided.